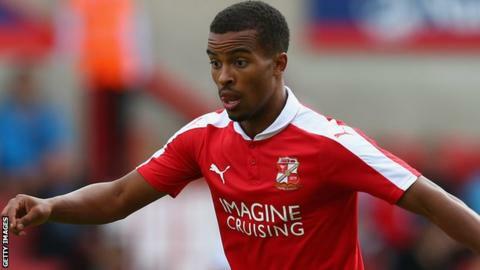 Swindon's Nathan Byrne scored a 16-minute hat-trick as the Robins come back from a goal down to beat Bradford. The visitors went ahead early on when Josh Morris struck, before Billy Clarke's poor penalty was saved. After the break, Byrne curled in his first before his close range finish under goalkeeper Ben Williams put the hosts in the lead. Byrne's third came after a mazy dribble and striker Jon Obika secured three points when he slotted home the fourth. Match ends, Swindon Town 4, Bradford City 1. Second Half ends, Swindon Town 4, Bradford City 1. Attempt missed. Kevin Stewart (Swindon Town) right footed shot from the centre of the box is too high. Fabien Robert (Swindon Town) is shown the yellow card for a bad foul. Foul by Fabien Robert (Swindon Town). Paul Anderson (Bradford City) wins a free kick in the attacking half. Substitution, Swindon Town. Will Randall-Hurren replaces Nathan Byrne. Steve Davies (Bradford City) is shown the yellow card for a bad foul. Foul by Steve Davies (Bradford City). Fabien Robert (Swindon Town) wins a free kick in the defensive half. Substitution, Swindon Town. Anton Rodgers replaces Yaser Kasim. Nathan Clarke (Bradford City) is shown the yellow card for a bad foul. Nathan Byrne (Swindon Town) wins a free kick in the defensive half. Foul by Nathan Clarke (Bradford City). Nathan Clarke (Bradford City) wins a free kick in the attacking half. Foul by Yaser Kasim (Swindon Town). Steve Davies (Bradford City) wins a free kick in the defensive half. Substitution, Bradford City. Mark Marshall replaces Josh Morris. Yaser Kasim (Swindon Town) wins a free kick in the attacking half. Foul by James Meredith (Bradford City). Corner, Bradford City. Conceded by Kevin Stewart. Substitution, Bradford City. Paul Anderson replaces Billy Knott. Goal! Swindon Town 4, Bradford City 1. Jonathan Obika (Swindon Town) right footed shot from the centre of the box to the bottom left corner. Assisted by Jordan Turnbull. Goal! Swindon Town 3, Bradford City 1. Nathan Byrne (Swindon Town) left footed shot from the centre of the box to the bottom right corner. Assisted by Nathan Thompson. Brandon Ormonde-Ottewill (Swindon Town) wins a free kick on the left wing. Foul by Christopher Routis (Bradford City). Substitution, Bradford City. Steve Davies replaces Billy Clarke. Yaser Kasim (Swindon Town) is shown the yellow card for excessive celebration. Goal! Swindon Town 2, Bradford City 1. Nathan Byrne (Swindon Town) right footed shot from the centre of the box to the bottom right corner. Assisted by Kevin Stewart. Attempt blocked. Jonathan Obika (Swindon Town) right footed shot from outside the box is blocked. Tony McMahon (Bradford City) wins a free kick in the attacking half. Corner, Swindon Town. Conceded by Nathan Clarke. Goal! Swindon Town 1, Bradford City 1. Nathan Byrne (Swindon Town) right footed shot from the right side of the box to the bottom left corner. Kevin Stewart (Swindon Town) wins a free kick in the defensive half.